High pressure is sitting over northern Wisconsin tonight. Low pressure is over the southern plains. A warm front is situated north to south from western South Dakota across eastern Colorado. The low over the southern plains, and a weak upper disturbance are causing some very light rain shower activity from eastern South Dakota southward across eastern Nebraska, and extreme southwestern Iowa across western Missouri. Dry air associated with the high over Wisconsin, and the light northeasterly air flow around the high is preventing the shower activity over the plains from making much eastward progress. Our region will have high clouds over running northern Illinois tonight, but they are expected to thin out overnight. Monday will be mostly sunny with afternoon high temperatues reaching the middle 50's. It will be mostly clear on Monday night, and down into the low to middle 30's again. Voting Day will be very nice for this time of year with light winds, sunny skies, low humidity, and comfortable afternoon temperatures in the middle 50's. On Wednesday a strong Canadian cold front will sweep across the area during the mid day hours possibly bringing some light rain showers or sprinkles to the Stateline. Temperatures will reach the low 50's before the front gets here. On Thursday the pressure gradient will tighten, it will become windy, and colder with an afternoon high in the middle 40's. Despite the lack of moisture with this system, there could be some light rain showers or sprinkles, and some wet snow flakes could mix in to the west and northwest of Rockford. The gradient will still be pretty tight on Friday, so it will continue to be breezy with a high only in the low 40's. The cold ridge of high pressure will settle in across the area on Friday night diminishing winds, and dropping temperatures into the 20's. Saturday will be sunny and chilly with a high in the middle 40's. On Sunday our region will pick up a southerly breeze in advance of the next front moving in from the northern plains. High temperatures on Sunday will top out near 50 degrees. Welcome to the month of November. Average temperatures will tail off quickly during the month, we will lose daynight savings time next Saturday night at 2 am, and the sun will set on Sunday around 4:45 pm. This will take some getting used to. Have a great week! A cool front moved across the area on Saturday evening, but it did not have any moisture to work with, so is it passed through as a dry front with very few clouds. The winds will be northeasterly tonight drawing in cooler air from Canada. It will be mostly sunny and cool on Sunday with high pressure dominating area weather. For Trick or Treaters on Sunday evening.... skies will be mostly clear, winds will be north to northeast around 5 miles an hour, and temperatures will be in the 40's. A dry cool pattern will persist for the coming week. A strong cold front will sweep across the area late Wednesday bringing even chillier Canadian air to the Stateline late in the week with afternoon temperatures holding in the 40's on Thursday and Friday, and nighttime lows in the upper 20's. The storm system that caused all that wind for the past 2 days is weakening as it moves northeast toward Hudson Bay in Canada. One last disturbance rotating around the low will keep skies mostly cloudy across northern Illinois this morning, but they should start to break up this afternoon. It will still be breezy, but not nearly as windy as it has been for the last two days. It will be cold, thouugh, with a high only in the middle to upper 40's. High pressure will take control of the weather tonight clearing skies and dropping temperatures into the middle 20's. Winds will continue to drop off and be in the 5 to 10 mile an hour range from the northwest overnight. It will be sunny and quiet on Friday with temperature recovering into the low 50's. The high will shift eastward during the day, and winds will go from light and variable in the morning to southerly 5 to 10 mph in the afternoon. The warmup will continue into Saturday with mostly sunny skies, and an afternoon high near 60 degrees. A weak front will stall out in the area on Sunday as low pressure moves from the plains across Illinois. Despite the fact there will be a front in the viscinity, and low pressure moving though, very little rainfall is expected because the Gulf of Mexico will be blocked by high pressure. The temperatures will drop off a few degrees on Halloween, but remain in the 50's on Sunday afternoon. High pressure will take control of Stateline weather again on Monday and remain in control, for the most part, for the rest of the week. No large changes in temperature are expected, with afternoon highs in the low 50's Monday through Thursday. 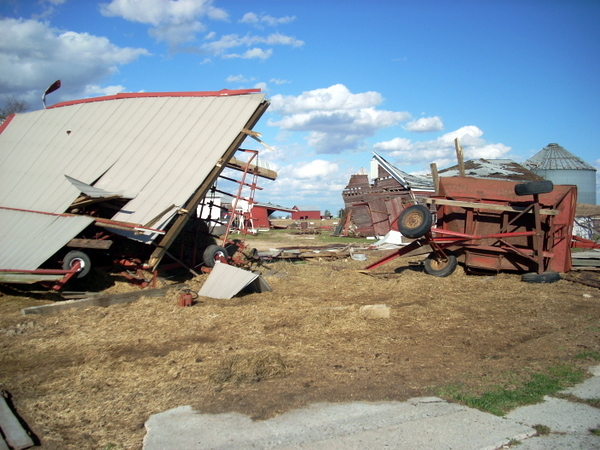 The National Weather Service out of Chicago did some damage surveys over the past couple of days in the Stateline area. They found that an EF1 tornado touched-down near Meridian road 3 miles east/southeast of Ashton in Lee county. Outbuildings and a silo were damaged, and a grain cart was flipped over. In addition, numerous 2x4's were found speared into the ground! The winds with this tornado were estimated at 95 mph. This all happened at approximately 5:41am Tuesday. One of the most intense, if not the most intense mid lattitude cyclone to ever pass though the upper midwest is still formidable, and located just north of the arrowhead of Minnesota in southwestern Ontario, Canada. It's central pressure plummeted to 28.20" yesterday, and is still nearly as low today. There is a very tight pressure gradiaent between the low and high pressure over the Rockies. After a sunny start to the day clouds will gradually move into the Stateline from the north. The winds will increase to 25 to 35 miles an hour with some gusts this afternoon reaching close to 55 miles and hour. So, a HIGH WIND WARNING has been issued by National Weather Service Offices for the entire Stateline until 7 pm this evening. Winds will still be strong this evening gusting to 40 miles and hour early, but diminish overnight to 15-25 miles and hour with gusts to 30 miles an hour. With the air flow veering to the northwest overnight, some light rain showers may reach as far south as Interstate 80, and there might even be some wet snow flakes over far northern Ilinois. Don't worry...there will not be any accumulation with warm soils and surface temperatures remaining above freezing overnight. The cyclone will weaken overnight and move to James Bay by 6 am on Thursday. It will still be quite breezy on Thursday under skies the will start out partly sunny, but become mostly sunny in the afternoon. It will be chilly with a northwest wind 15 to 25 miles an hour, and gusts as high as 30 miles an hour, before diminishing later in the afternoon. The high temperature will be only in the middle 40's. High pressure from the plains will take complete control of our weather on Thursday night, and under clear skies the temperature will drop into the frosty middle 20's. With high pressure directly overhead on Friday winds will be light, and skies will be sunny. The temperatures will recover a few degrees back up into the low 50's. It will remain mostly sunny on Saturday as high pressure shifts into the southeastern states, the wind will become southwesterly, and the temperatures will recover into the mid to upper 50's in the afternoon. By Sunday low pressure will be spinning up near Kansas City, and a warm front will lie east of the low across Illinois south of Interstate 80. The proximity of this system may cause some light rain showers, but the Gulf of Mexico will be blocked from pumping moisture into northern Illinois. So rainfall amounts are expected to be meager with only a few hundredths of an inch possible. A few showers may persist into Sunday night. High pressure well to the north in Canada will cool temperatures by a few degrees early next week as winds turn to the northeast. The current storm system will more than likely go down in the record books and could potentially be the strongest we've seen in over 70 years! Looking back at some of the most notable storms across the region, and if the current forecast stands correct, this storm will fall right behind the Great Ohio Blizzard back in 1978 where the minimum central pressure dropped to 28.05". Right now, the lowest pressure I could find was at 28.38" reported in Duluth, MN. This has actually broken the all time lowest pressure record in Minnesota! Wow! The low will continue to strengthen as it moves through northeast Minnesota and into northern Wisconsin by tonight. Gusty winds, already getting reports of gusts over 50 mph, will continue through the rest of the afternoon! EXPECT 4 TO 8 INCHES OF SNOW. 2 TO 4 INCHES OF SNOW IS POSSIBLE ALONG A LINE FROM WILLISTON TO GARRISON...BISMARCK TO JAMESTOWN AND SOUTH TO WISHEK TO ELLENDALE. 1 TO 3 INCHES OF SNOW IS LIKELY WEST OF THE MISSOURI RIVER. ﻿The cold front continues to move east this morning producing severe weather across portions of southeast Wisconsin and south of Chicago where numerous tornado warnings were issued along with a few reports of tornado touchdowns and reports of funnel clouds. Winds continue to gust this morning as high as 40 mph with sustained winds coming in between 20 -25 mph. There may be a few scattered showers that could pass through later this morning as the low continues to pull northeast of Wisconsin. High Wind Warnings remain in effect for all of the WTVO viewing audience until this evening. (10:03:31 AM) nwsbot: MKX: Janesville Airport [Rock Co, WI] awos reports NON-TSTM WND GST of M51.00 MPH at 09:45 AM CDT -- kjvl gust to 44 knots. sustained wind 33 knots. (9:10:45 AM) nwsbot: MKX: Monroe Airport [Green Co, WI] awos reports NON-TSTM WND GST of M48.00 MPH at 08:55 AM CDT -- keft gust to 42 knots. (7:45:06 AM) nwsbot: DVN: Thomson [Carroll Co, IL] law enforcement reports TSTM WND DMG at 05:46 AM CDT -- tree down - estimated time of occurrence. (7:45:06 AM) nwsbot: DVN: Chadwick [Carroll Co, IL] law enforcement reports TSTM WND DMG at 06:05 AM CDT -- power lines down. estimated time of occurrence. (7:45:06 AM) nwsbot: DVN: Shannon [Carroll Co, IL] law enforcement reports TSTM WND DMG at 06:18 AM CDT -- power lines down. estimated time of occurrence. (6:55:53 AM) nwsbot: LOT issues Tornado Warning for Kane [IL] till 7:30 AM CDT ...* AT 654 AM...NATIONAL WEATHER SERVICE DOPPLER RADAR INDICATED A LINE OF SEVERE THUNDERSTORMS CAPABLE OF PRODUCING A TORNADO. THESE DANGEROUS STORMS WERE LOCATED NEAR ELBURN...AND MOVING NORTHEAST AT 50 MPH. (6:54:01 AM) nwsbot: MKX: 3 Ne Beloit [Rock Co, WI] trained spotter reports TSTM WND DMG at 06:37 AM CDT -- partially destroyed billboard entangled in power lines at milwaukee rd and freeman parkway. (6:41:15 AM) nwsbot: LOT: 5 Nw Rockford [Winnebago Co, IL] law enforcement reports TSTM WND DMG at 05:45 AM CDT -- a few trees and wires down in the unincorporated portion of rockford. (6:29:11 AM) nwsbot: LOT: 5 Nne Forreston [Ogle Co, IL] law enforcement reports TSTM WND DMG at 05:12 AM CDT -- one large tree down about 5 miles north-northeast of forreston near the stephenson county border. New Tornado Watch issued to include counties east of Rockford, including the Chicago Metro region. 3:00 am Update: Moderate to heavy rain continues to extend from southern Wisconsin down through the Quad Cities moving northeast around 50 mph. As of right now there are no warnings but we are still under a Tornado Watch until 6am. The cold front extends back through Iowa and will quickly race east within the next couple of hours. What we'll be watching for are any storms that may develop out ahead of the main line, like a few that have developed south of I-80. Wind shear still remains very high so that's why the tornado watch will continue. We have already seen wind gusts early this morning around 45 mph! So even if all we get is heavy rain out of these storms, it is still going to be very windy! It's Gonna Get Windy...Be Ready! Noon Update: Going forecast still looks on track. Expecting a squall line of storms to develop along cold front during the early morning hours Tuesday, roughly around 3am - give or take. As these storms roll through we're still looking at the potential for strong winds as the Storm Prediction Center has most of northern Illinois/southern Wisconsin highlighted in a slight risk. Once this front passes, it will be quick, look for sustained winds Tuesday afternoon around 35-40 mph with gusts in excess of 50 mph! 11:00 am Update: Will have conference call with the Weather Service in about a half an hour to discuss the severe potential and wind threat. Details will soon follow! that could gust close to 60 mph! Power outages and damage are possible Tuesday afternoon. Another thing we have to be on the lookout for will be a cold front slated to move through by Tuesday morning. There may just be enough instability and shear to get a few stronger storms going by daybreak. If this were to occur the main threat would be for damaging winds. By Tuesday afternoon the front will have moved to the east and we will likely dry-slot (where dry air gets wrapped into the backside of a storm system). This could potentially be where our strongest winds come from. Make sure you put anything that can fly around (like garbage cans, outdoor furniture, etc) inside later today. Because chances are if you leave it out you won't see it again! North/south roads will likely be difficult to travel especially if you have a high profile vehicle. Since we last got together the final totals for Saturday's rainfall have been tallied, and the result is that the Rockford Airport had a grand total of 1.71" of rain for a new record for October 23rd. It is also the greatest amount of rainfall in a calendar day since July 24th when 2.81" was recorded. The 2 day total for Rockford is 2.28" brought an end one of the driest starts to October in many years. A line of heavy thunderstorms developed off to the southeast of Rockford earlier tonight moving across the Chicagoland area into northwest Indiana. All that is left of precipitation over northern Illinois are some scattered light rain showers over Stephenson County and Whiteside County as of 12:20 am on Monday morning. After those showers move into Wisconsin, rains should be over for the rest of the night, and Monday. North central Illinois will be in a warm sector on Monday under partly sunny skies, a southerly wind with afternoon temperatures reaching the low to middle 70's. A power jet stream (160 - 180+ knots) is crossing the Rockies tonight, and entering the central plains. It will spin up an rapidly intensifying surface low pressure near Kansas City Missouri on it's nose by 7 pm on Monday evening with a central pressure of 29.18". By 1 am on Tuesday morning it will be located just southwest of Minneapolis with a pressure down to 29.00", and it will be dragging a cold front south across eastern Iowa. Strong southwesterly winds (with a low level jet of 55 to 60 knots) will increase ahead of that front across the Stateline on Monday night pumping in mild moist air from the Gulf of Mexico. Showers and thunderstorms will spread from Missouri and eastern Iowa northeast across northwestern and north central Illinois overnight with winds increasing to 15 to 25 mph with gusts above 40 mph by morning. Because of the continuing intensification of this storm system HIGH WIND WATCHES have been issued by the National Weather Service beginning late on Monday night for northwestern Illinois, and by noon on Tuesday for north central Illinois. The storm will be centered near Duluth, Minnesota by 7 am on Tuesday, and the central pressure will be down to 28.73" as is slings a powerful cold front across northern Illinois into Lake Michigan. By 7 pm Tuesday the storm will be centered just northwest of Lake Superior with an amazingly low central pressure of 28.38". Because of the extremely low pressure associated with the storm and the exceptionally tight pressure gradient, winds in northern Illinois will be Illinois will be increasing from 20 to 40 mph with gusts to 55 mph, and possibly higher until late Wednesday. If the strong does intensify to around 28.38", it may end up being the strongest Great Lakes Cyclone since the great Armistice Day Storm of 1940! As of this writing, winds are expected to reach 64 mph on Wednesday out over the open waters of Lake Superior with waves to 21 feet. Impressive... don't you think? Hang on to your hats! Surface low pressure is over Nebraska this evening, and a warm front stretches eastward from that low across Iowa and Illinois just south of Interstate 80. Northern Illinois has had several rounds of rainfall today. The first one this morning was associated with a upper disturbance riding across the area. Another disturbance is moving from Iowa into nothern Illinois tonight in association with a strong low level jet pumping in Gulf moisture from the south riding up and over the warm front to our south generating numerous showers and some thunderstorms overnight. It will continue to be very mild the warm front lifting to the north into Wisconsin so that overnight lows will be about 20 degrees above average. The Stateline will be in the warm sector from Sunday through Monday night. It will be in the upper 60's on Sunday, and into the middle 70's on Monday. Scattered showers and thunderstorms will continue on Sunday, and some showers will persist into Monday morning before skies become partly cloudy later in the morning through the afternoon. A very intense low pressure system is expected to develop over the Iowa/Minnesota area on Monday night, bringing another round of showers and thunderstorms to the area into Tuesday morning in advance of a strong cold front. Because of the intensity of the low, winds are expected to be very strong over all of the upper midwest. There will be gale warnings across the Great Lakes on Tuesday which will likely be elevated to Storm Warnings by Wednesday. High wind advisories will likely be issued by the National Weather Service for the Stateline on Tuesday with winds up to 45 mph, and it is possible the parts of the area may see high wind warnings issued. This is expected to be an extremely strong storm system. It will push a cold front through the Stateline early Tuesday morning. High temperatures will be cooler on Tuesday, but not drastically so... in the low 60's. Progressively colder air will wrap around the intense low over Lake Superior on Wednesday restricting our high's to the low to middle 50's, and by Thursday temperatures will not rise out of the upper 40's. Thursday morning NOAA released its 2010/2011 Winter Outlook. 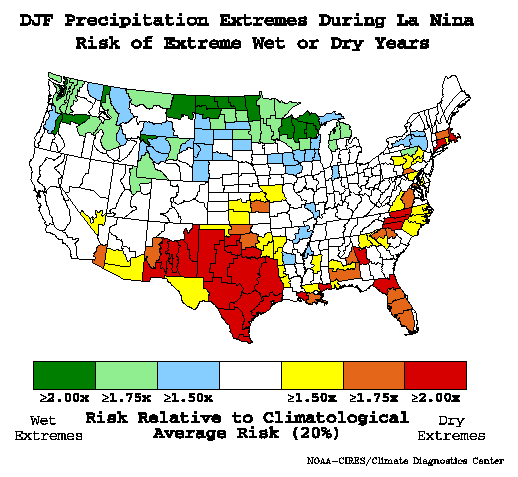 A moderate to strong La Nina will be the dominant climate factor influencing much of the weather across the U.S. this winter season. 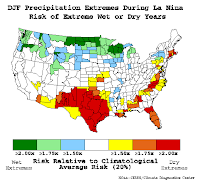 Typically during a La Nina season the weather can vary more but look for above average precipitation across the northern Plains and in the Pacific Northwest while below average precipitation and above average precipitation throughout the south. For us, we could end up seeing above average snowfall during this winter! 8 AM CDT /9 AM EDT/ FRIDAY. RESULT IN SOME PATCHY FROST IN THESE WARMER LOCATIONS. TEMPERATURES AT GROUND LEVEL MAY BE SEVERAL DEGREES COLDER THAN THE REPORTED AIR TEMPERATURE...WHICH IS MEASURED TWO METERS ABOVE THE GROUND. * IMPACTS...PRECAUTIONARY/PREPAREDNESS ACTIONS...TENDER...NON INDIGENOUS VEGETATION LEFT EXPOSED OVERNIGHT MAY BE DAMAGED OR KILLED. 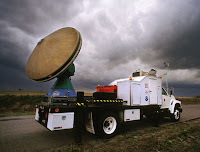 Have you ever thought about a career in science or wondered how the DOW (Doppler on Wheels) works? Here's your chance! The College of DuPage, in Glen Ellyn, will be hosting a special event Thursday, October 28th at 10am where you can learn all about storm chasing along with careers in the Atmopsheric Sciences field AND get an up close, hands on experience with the DOW. While it may not be as exciting as Storm Chasers on the Discovery Channel, every year there are several research projects that are carried out to help study a wide range of events. So if you're thinking about a career in the Atmospheric Sciences field or are just a weather enthusiast, this will be a great opportunity for you! THE NATIONAL WEATHER SERVICE IN CHICAGO HAS ISSUED A RED FLAG WARNING...WHICH IS IN EFFECT UNTIL 7 PM CDT THIS EVENING. SOUTHWEST WINDS WILL GUST TO 20 MPH OR MORE THIS AFTERNOON. MINIMUM RELATIVE HUMIDITY WILL BE 20 TO 30 PERCENT. THE WIND AND THE LOW HUMIDITY WILL CONTRIBUTE TO AN INCREASED FIRE DANGER THIS AFTERNOON. LACK OF RAIN AND LOW HUMIDITY HAS CREATED VERY DRY CONDITIONS. A RED FLAG WARNING MEANS THAT CRITICAL FIRE WEATHER CONDITIONS ARE EITHER OCCURRING NOW...OR WILL SHORTLY. A COMBINATION OF STRONG WINDS...LOW RELATIVE HUMIDITY...AND WARM TEMPERATURES WILL CREATE EXPLOSIVE FIRE GROWTH POTENTIAL. We've been very quiet in the weather department the past couple of weeks but that could all be changing by this time next week. A cutoff low in southern California will begin to move east and into the Great Lakes by this weekend. As it does, it will get caught up in the main jetstream and weaken some but still be able to draw in enough moisture from the Gulf of Mexico to produce a few showers Saturday and Sunday. The beginning of next week, however, could prove to be a little more active. Very strong winds in the jetstream, roughly around 150 mph, will come crashing into the west and help dig out a trough across the central Plains. This will lead to a cold front sweeping through sometime during the Tuesday timeframe (assuming all things come together within the next week). If this scenario holds true we could very well see a nice warm up early followed by thunderstorms sometime Tuesday/Wednesday and then a cool down by the end of next week. Talk about one roller-coaster of a ride. I've entertained some calls and comments from viewers who are concerned about the dry weather we've seen here across the Stateline. And these concerns are justified! We haven't seen measurable rain in Rockford since October 2nd when just 0.01" of rain fell. Although we did manage 0.15" of rain on the 1st of the month, October is thus-far running 1.38" below normal. A cool front passed though the area during the early evening. The wind has shifted to the north under clear skies. Lower dew point air is moving in from the northwest. Temperatures will drop off to the low 40's by daybreak, and it will be cooler on Sunday with a high in the low 60's. Skies will start off mostly sunny in the early morning, but become partly cloudy during the afternoon. An upper distubance approaching from the plains will generate some scattered light rain showers on Sunday night and Monday. With lots of clouds around on Monday the temperature will be cool with a high only in the middle 50's. The disturbance will ride off to the east on Monday night leaving skies mostly clear once again. The dry weather pattern will return for the rest of the week with seasonal temperatures. A cool ridge of high pressure stretching from Canada across Lake Superior, western Wisconsin, Iowa, and Missouri will settle down across the Stateline overnight. The skies will be clear, and with near calm winds and dry air, the temperature will fall to near 40 or into the upper 30's by daybreak. The high will shift quickly off to the east on Saturday, and the winds will switch to the south, and pick up in advance of the next front moving southeast across the plains. There will also be a nice warmup into the low 70's by mid afternoon under sunny skies. The atmosphere is so dry, and the Gulf of Mexico will be completely cut off so that when the cool front passes through the Stateline late in the day there will not even be many clouds. It will be mostly clear overnight on Saturday night, and with cooler air pushing in from the north the temperatures on Sunday, will top out in the low 60's. The front will stall out in central Illinois on Sunday, and a disturbance will move along the front out of the plains on Sunday night and Monday. There is very little moisture available, but with good lift to the north of the front is appears as if we will see fairly widespread light rain on Sunday night and Monday. Not more than a few hundredths of an inch is anticipated at this time, so our dry weather pattern will continue. With lots of clouds and a north to northeast wind on Monday it will be chilly with highs only in the upper 50's. Despite mostly sunny skies on Tuesday, but it will continue to be cool with a high again only in the upper 50's. There will be a slow warm up under mostly sunny skies for the rest of the week taking temperatures back into the upper 60's by Friday afternoon. Heavy rain and very gusty winds continue to spread across the northeast this morning as a very strong (988mb) low moves along the eastern sea board. Mount Washington, NH surely lives up to it's "World's Worst Weather" status today as sustained winds have reached 72mph with gusts nearing 82mph, blowing snow and freezing fog. Temperatures sit at a toasty 29° with a wind chill of 8°. Click here to see updated conditions and a look at their webcams. Talk about an Indian Summer! It's getting a little 'hot' in Rock County! The Milwaukee/Sullivan National Weather Service will no longer issue any frost or freeze headlines this season. Temperatures at the beginning of the month fell at or below freezing for a couple days, ending their growing season. In Rockford, we have yet to drop below freezing. Our lowest temperature was 35° on the 5th. 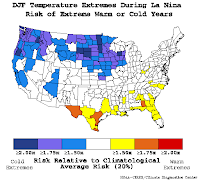 NOAA/ESRL Physical Sciences Division in Boulder, Colorado shows the threat risk for a colder and snowier than normal winter. The second highlights precipitation. The past couple La Nina events we've had around the area have tended to see above average snowfall and below average temperatures. Just In: At approximately 9:06 am this morning a 4.3 magnitude earthquake occurred 6 miles east/southeast of Norman, Oklahoma. Click on the USGS link for more information. So far no damage has been reported. Tuesday Morning: Paula has been upgraded to a Category 1 Hurricane with winds now reaching 75 mph. While Paula will continue to move over very warm ocean temperatures in the Caribbean sea, the atmospheric conditions will likely become less conducive for intensification with an increase in wind shear and dry air. The strong upper ridge that has been over the northern Illinois for the past few days is breaking down. A backdoor cool front will edge into northeastern Illinois on Monday, and there may be enough instability to generate a couple of widely scattered showers and possibly a thundershower. Chances of any measureable rainfall on Monday are very low. Other than that it will be partly sunny with an afternoon high in the middle to upper 70's. A large slow moving upper low over Nebraska tonight with drop southeastward into Arkansas keeping it circulation of showers and thunderstorms far to our southwest. Skies on Monday will be mostly sunny over northwestern Illinois, and there will be more clouds from north central into northeastern Illinois. The backdoor front will stall out right over the Stateline on Monday night as a Canadian high drops southeast across Ontario. On Tuesday it will fade from the picture as a stronger cool front moves into the area on Tuesday night. It may generate some scattered showers on Tuesday night and early in the morning on Wednesday. Again, very little rain is expected, and our very dry pattern of the last couple of months will continue as a Pacific high pushes eastward across the Rockies. The coolest day of the week is expected to be on Thursday, but it will not be that cool. Temperatures are just expected to be knocked back down to average by that time, and a gentle warming trend will allow temperatures to begin to recover towards 70 degrees for afternoon highs next weekend with mostly sunny skies. All Time Record High of 90 Degrees in Rockford for so Late in the Season!!!!! The temperature reaching an amazing mid summer like level of 90 degrees at the Rockford Airport this afternoon for an all time record high for so late in the season. It will not be quite as warm on Sunday, but will still be very warm for this time of year with a high around 85 degrees under sunny skies. The record high for Sunday is 88 degrees set in 1938. So, it is not that far out of reach. The afternoon high temperatures have been higher than the forecast models because of the unusual weather pattern along with very dry air and dry soils across the Stateline. Dry air is much easier to heat up than moist air, so we have been seeing more than 30 degree diurnal ranges in temperature when the average range is around 23 degrees. This air is very desert like. On Monday it will be a little cooler, but still well above normal with a high in the upper 70's. One factor that may make temperatures a little lower is a backdoor cool front that has slipped from Canada, directly southward across Wisconsin into northeastern Illinois with a little help from Lake Michigan, and a breeze coming in from the northeast off the lake. If that front should sag a little futher to the south into, or across, the Stateline as Canadian high pressure moves southeast across Ontario, it will result in cooler temperatures for northern Illinois. On Monday, provided our region is still on the warm side of the front, temperatures will rise into the upper 70's under mostly sunny skies, and on Tuesday it will be another warm day in advance of a cool front pushing in from the northwest. On Tuesday night and Wednesday morning there may be some light rain showers or sprinkles with the cool frontal passage. This front will not result in a drastic cool down as the air following in behind it is mostly of Pacific origin, so temperatures will just fall back to seasonal averages for a couple of days with highs in the 60's before we begin another warming trend taking tempertures back into the 70's by late week with more days of sunshine. It will be a dry week with the Gulf of Mexico pretty much shut off, so precipitation amounts on Tuesday night and Wednesday should not amount to more than a few hundredths of an inch, if that! ......but how long can this wonderful weather last. I will answer that question for you in today's blog, but first let's take a look at what is going on right now. An upper level ridge of high pressure is arching across the Midwest, blocking the area from any significant frontal intrusions. A surface high is located over Missouri, and because high pressure is completely dominating our weather, the Stateline will see temperatures well above average right through the Columbus Day Weekend. Along with the warm temperatures, which will reach the low 80's today, Saturday, and Sunday, sunny skies will prevail, so our dry weather pattern will continue. This weekend will seem more like summer than early fall. Despite temperatures in the 80's, it will be very comfortable because of the low humidity. Afternoon relative humidity's could drop as low as 15%, which is nearly low as is typical in desert areas of the southwestern US. A backdoor cold front slipping southward out of Canada will approach the area on Saturday afternoon as a large high in Canada moves southeast across Ontario. It does bear watching, because if it moves in early in the day, it could keep temperatures a little lower than anticipated. The front will stall out across the area on Saturday night, and lift back toward the northeast as a warm front on Sunday. A weakening low will dissipate as it moves into Illinois on Monday morning as it is absorbed within the upper ridge of high pressure. No rain is anticipated with this system, just an increase in cloudiness. The lingering surface trough of low pressure will cause skies to be partly cloudy into Tuesday, and temperatures will drop off a few degrees, but remain above normal with an afternoon high in the low 70's. A much stronger upper trough, and it's associated cold front will approach the area on Tuesday night. With very little moisture inflow from the Gulf of Mexico, there will only be some scattered light rain showers on Tuesday night and Wednesday. Cooler air will sweep into the area on Wednesday, and high temperatures will drop back into the low to middle 60's. On Thursday it will be partly cloudy with a high in the low 60's. So, enjoy the summer like weekend, because it will be considerably cooler by midweek of next week. High pressure over the eastern half of the country will give many an unseasonably warm weekend. The participants in the 33rd annual Chicago Marathon will be no exception, as runners may experience the third-hottest race in 20 years. The dreary conditions most of the East and Midwest endured for much of the week will finally give way to sunshine, dry weather and unseasonable warmth. On Sunday, runners and spectators in Chicago will have partly sunny skies throughout the marathon with a light southwest wind. Temperatures will start out near 60 degrees at 8 a.m., eventually warming to a high near 80 degrees. Humidity will not be oppressive. This weather will be a stark contrast to last year's conditions. 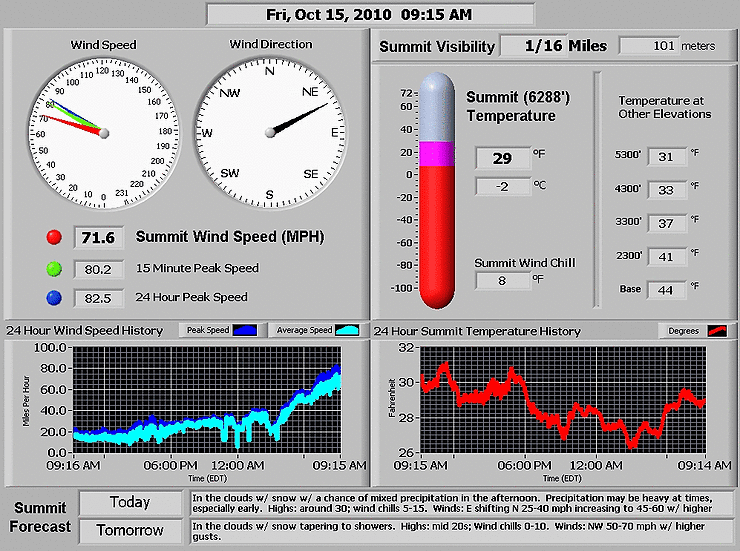 The October 11, 2009 marathon had a high of 48 degrees. Temperatures in the mid-60s are typical for this time of year. If Sunday's expected high holds true, this will mark the third-hottest Chicago Marathon since 1990. In 2007, temperatures soared to 88 degrees with high humidity, while the low earlier that morning was 70 degrees. The searing temperatures caused race officials to call off the race after four hours. About 50 people were hospitalized, and a 35-year-old man died due to a heart condition. AccuWeather.com meteorologists estimate the RealFeel(tm) temperature that day was about 94 degrees. One year later, the temperature hit a high of 86 degrees, although the morning low was 62 degrees and the humidity was significantly lower. AccuWeather.com meteorologists estimate the RealFeel(tm) that day was 86 degrees. High pressure over the plains pushed a cool front through the area late yesterday. It's effect on the weather has been minimal. Temperatures will be a little cooler than yesterday when the Rockford Airport topped out at an amazing 81 degrees. Today will be around 76, but that is still well above normal for this time of year. High pressure will move to Iowa today, and Illinois tonight. It will continue to provide sunshine to the Stateline right through Saturday. Very warm temperatures will return on Friday with a high near 80, and on Saturday it will reach the low 80s. The next chance of rain will be on Sunday. Temperatures will fall off a few degrees because of an increase in cloud cover, but it will still be warm with a high in the middle 70's. On Monday a low pressure area moving across the area will bring cooler air into the Stateline. Under mostly cloudy skies with scattered showers, the temperatures will drop back to more seasonal levels in the upper 60's. A cooling trend will last into midweek. Local weather stations today had a roller-coaster ride on the temperature scale! After lows reached the 30s for many locations, highs reached 80 degrees or more! Rochelle, for example, had a morning low of 35 and an afternoon high of 80. Sterling recorded an even higher range in temperature with a low of 34 and a high of 81! And temperatures at the Rockford Airport started-out at 39, then rose to 81 for a high. Our normal high and low are 67 and 44 for this date. So we would typically see a range in temperature of 23 degrees, not the 47 degree swing we saw today in some locations! The cold air of recent days has finally exited the area. Temperatures reached the low 70's yesterday afternoon, and 70's will continue through Sunday. You can expect lots of sunshine too. This is really an excellent spell of weather for this time if year. There may be a few clouds later this afternoon as a wind shift line moves across the Stateline, but without much moisture available, there will not be any rain. The afternoon high today will reach 75 degrees. On Thursday it will be 73 degrees, and of Friday and Saturday it will be in the middle to upper 70's. An 80 degree reading cannot be ruled out. On Sunday a disturbance moving eastward out of the plains will increase clouds, and lower temperatures a few degrees to the low to mid 70's. As the low pressure moves though the midwest, there will be a chance of some light rain showers or sprinkles on Sunday night continuing into Monday. The system will be clear of the area by Tuesday with a fresh high moving in from the plains. So, Tuesday should be sunny to mostly sunny with a high temperature in the upper 60's. Canadian high pressure, sitting over Illinois this morning, was responsible for another cold frosty start to the day. Overnight low temperatures were pretty much the same as last night. With the high shifting gradually off to the south and moderating, temperatures will top out near seasonal averages this afternoon under full sunshine. A blocking upper high is also locking in place across the middle part of the country, and it will not allow any significant frontal systems to pass through our area for the next week. There will be a weak front that drops through the area late Wednesday, but it is not expected to have much of an impact on our weather or much on temperatures. The Gulf of Mexico is cut off, so the front will not have a significant moisture to work with, and will pass through as a dry front with just a few clouds on Wednesday night. After today the rest of the week through the weekend will have afternoon temperatures ranging from the low to middle 70's with lots of sunshine. One viewer and one of my co-workers today asked me if the pollen count was up. Since I am lucky enough not to suffer too severely with allergies, I didn't really notice. The viewer who called me reasoned the corn harvesting might be elevating the area pollen levels. So I walked around outside earlier this evening, and noticed that there does seem to be something extra in the air. It actually smelled like corn husks to me. Good morning.... Canadian high pressure settled into the Stateline ovenight. The result was clear skies, light winds, and excellent radiation of heat out to space. 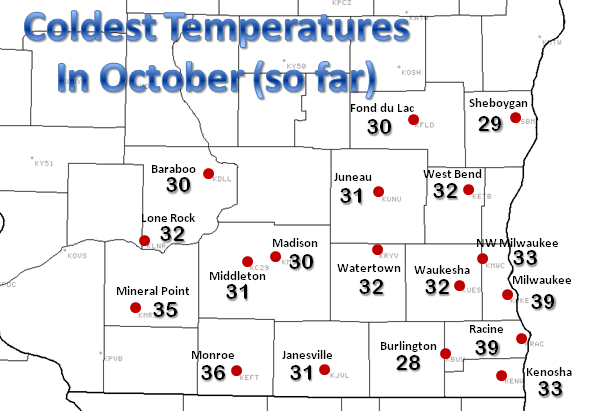 Frost was widespread overnight across north central Illinois, norhwestern Illinois, and southern Wisconsin many areas saw the growing season come to an end with freezing and subfreezing temperatures. Rockford did not officially get down to freezing with a preliminary low of 36 degrees. Rochelle was the coldest with a reading of 29 degrees. Freezing temperatures were also reported at Freeport and Sterling. It will be a cool day today with the Canadian high remaining over the area, but there will be full sunshine and light winds making it a much more comfortable day than our area had over the weekend. Sunshine will be a major factor this week with a high pressure ridge building eastward across the area by midweek, and then holding in place through the weekend. The surface high will be slowly shifting southward and warming up. The net result for the Stateline will be temperatures warming into the low 70's by Wednesday and the middle 70's by Friday through the weekend. It could possibly reach the upper 70's on the weekend. No rain is expected for the next 7 days. Enjoy this beautiful fall weather. A cold ridge of Canadian high pressure centered over Minnesota is feeding the coldest air of the season into northern Illinois. A FREEZE WARNING has been issued for Stephenson County and the rest of far northwestern Illinois from 4 am until 9 am Sunday. It will be mostly clear and cold across the north central part of north central Illinois with light northerly winds and widespread frost outside of the city of Rockford. Sunday will be mostly sunny and chilly with afternoon temperatures around 57 degrees. Sunday night will be frosty again. It is likely to be colder than Saturday night in the Rockford area, and areas of northern Illinois off to the south and east because Canadian high pressure will be sitting right over the area along with calm winds and good radiational cooling. There will be a slow warmup this week as the high pressure edges slowly off to the south. With high pressure dominating, sunshine will be a major factor all week long. No rain is expected, even though a weak dissipating front will move into the area on Wednesday night. Temperatures are expected to reach the low 70's by Wednesday, and possibly the middle 70's Friday and Saturday.